It’s cool now, but in the future, carrying a credit card or smartphone to tap and pay is going to seem ridiculously antiquated. Payments will happen in the background, magically. That’s the vision Ajaypal Singh Banga is working toward. As the chief executive of Mastercard (MA), he’s on the front lines of tomorrow’s financial technology. Investors should get ready, because this is going to be epic. Banga was at a the Fintech Ideas Festival last Wednesday, an event was sponsored by the Bank Policy Institute. For rank and file investors, policy conferences often seem a bit like watching how the sausage gets made. However, the video of Banga’s sit down with Andrew Ross Sorkin of CNBC is a must see. Click and watch it now; I’ll wait. The affable business leader believes an internet of things revolution is underway. In his view, perhaps up to 50 billion devices will be interconnected within a decade. Gas pumps and carwashes will hook up with the computers in cars. And everything will share a connection with our encrypted, personal financial information stored away in the cloud. Machine to machine payments will be only one stream in a torrent of digital possibilities. It’s not Banga’s first big idea. He promised a “war on cash” when he took over at Mastercard in March 2010. Five years later he joined with the World Bank to promote financial inclusiveness. Ultimately, he committed to help 500 million people worldwide gain access to the banking system. There is a business angle. Mastercard is a transaction processor. Bringing more out of the shadow economy marginalizes cash. Governments win because tracking taxes and skewering black market hawkers is easier. Mastercard wins because as bank accounts multiply, digital transactions grow exponentially. In 2016, the brilliance of his vision became apparent. India, the fastest growing economy in the world, banned its most widely circulated cash notes. Frantic Indians rushed to banks, leading to millions of new accounts. It was all by design. Despite its puny per capital income of just $2,134, according to data from the World Bank, India has become a beacon of progress for the digital world. The country launched Aadhaar in 2009, a biometric database for every man, woman and child. The massive IT project provided a unique 12-digit identity number, authenticated by fingerprint and retinal scans. Since then, a series of open source APIs added digital payments, electronic Know Your Customer verification, eSign, and a digital locker, for the safe transfer of health and financial documents. This India Stack means 1.1 billion people can open bank and brokerage accounts, buy insurance, send money and share medical records with healthcare providers anywhere in the country, with a simple fingerprint scan. The foundational system reduces friction, adds transparency and gives citizens control over their data through biometrics. It’s light years beyond tapping an iPhone to pay for a vanilla latte. It relegates hardware to simple inputs. It also provides the kind of scale required to bring transactions to connected machines. That’s where the magic begins. Banga puts the ETA for this IoT nirvana only five to ten years away. That’s soon. And it’s going to change everything we now believe to be true about money, payments and infrastructure. Only a handful of companies have the scale, expertise and policy bona fides to pull off something this big. And rest assured, it is going to happen because it serves the interests of government, the financial services industry and ultimately consumers. 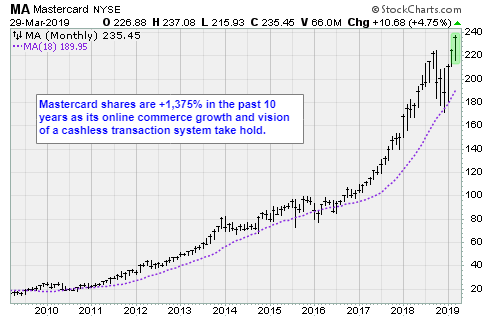 Mastercard is an obvious choice for investors. Under Banga, the Purchase, N.Y., company is playing a leading role in the future of fintech. Its state of the art transaction systems, cybersecurity and wide ranging partnerships will be even more important as everything from subway rides to government transfer payments go fully digital. And Visa (V), American Express (AXP) and PayPal (PYPL) will prosper, too. This is a digital transformation story. The growth of the less-cash world benefits all transaction processors. Banks will also share the spoils. Moving away from passwords and toward biometrics will reduce garden-variety identity theft fraud in a meaningful way. However, one should bet most on Banga. Mastercard was worth $31.2 billion in 2010, when he began guiding the company. Nine years later, the market capitalization is $247 billion. Shares have soared 885%. Even with the growth, the stock trades at only 26.5X forward earnings. That is entirely reasonable given where transaction processing is headed, and Mastercard’s position. The shares could easily move to $325 by 2021 as multiples expand further as confidence grows.